Step 1: We installed brand new Oracle DB server on Linux and new Windows App Server for the ALM for the new production environment. Also we needed an extra temporary Windows application server that is same version as existing QC11 App Server. This temporary server is not mandotary, this is just to make this process much safer. Step 2: Install QC11 application on the temporary application server that mentioned in Step 1. You can use out of box 30 days evaluation free licenses. No extra license needed for this process. Installing same patches on current production enviroment to this temporary server is suggested. The DB server for this temporary application server is going to be your new production server's DB as shown in the following screenshot. Step 3: Open your current production environement's Siteadmin and Disable the project you want to upgrade and migrate from the Site Projects tab. In the Site Projects tab select Project Details tab and take note the Project Directory property. Verifying and Repairing the project from the Maintain Project menu suggested. Step 4: On the current production QC server open the project directory path and then open the ProjRep folder in that directory. You'll see "000" folder there. Cut-Paste this folder to somewhere else in the same drive (C:\TempALM_Rep\MyProj1). Step 5: From the current production environment's Siteadmin panel right click on the project and select Export Project option. Cut-Paste operation in Step 4 is going to decrease the time needed to export project. This process can take upto 1 hours according to your project's size. When the export operation finishes Cut-Paste the "000" folder to it's original location. The project should be still deactivated. Step 6: Open you temporary QC Server's Siteadmin panel. Go to Site Projects tab and select Create Project. 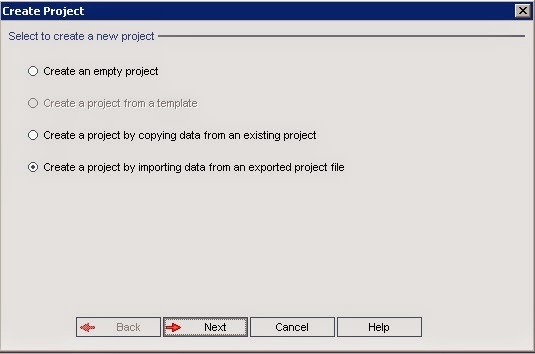 Select "Create a project by importing data from exported project" option. Do not forget that you are importing the project to your new production DB server now. This import process can take upto 1,5 hours according to your project's size. Step 7: From the temporary QC Server's Siteadmin right click on the imported project and select Remove Project option. This will remove the project from the PROJECTS table, not going to drop the project's DB Schema. Step 8: You can start copying repository folder's "000" directory from the existing production application server to new ALM application server's drive (to a temporary folder). Step 9: Open the ALM App Server's repository path. There should be LAB_PROJECT directory (if not you can create an empty project). Drill-down the LAB_PROJECT's repository folder, you are going to see "dbid.xml" file. In this file you can see you DB User's hashed password between the DB_USER_PASS tags. Write down this value to somewhere. Step 10: From the temporary QC server Copy the project repository folder to new ALM Server's repository path. After the temporary project's repository copied drilldown to repository and you'll see "ProjRep" folder. Copy and overwrite the "000" directory inside ProjRep folder that you copied before on Step 8.
a) Open the dbid.xml file on the ALM Server and check the DB_USER_PASS value. It should be same as the value that you checked on Step 9. If not change that value to same value as Step 9.
b) Check PHYSICAL_DIRECTORY value. It should be the path that you copied the repository to. 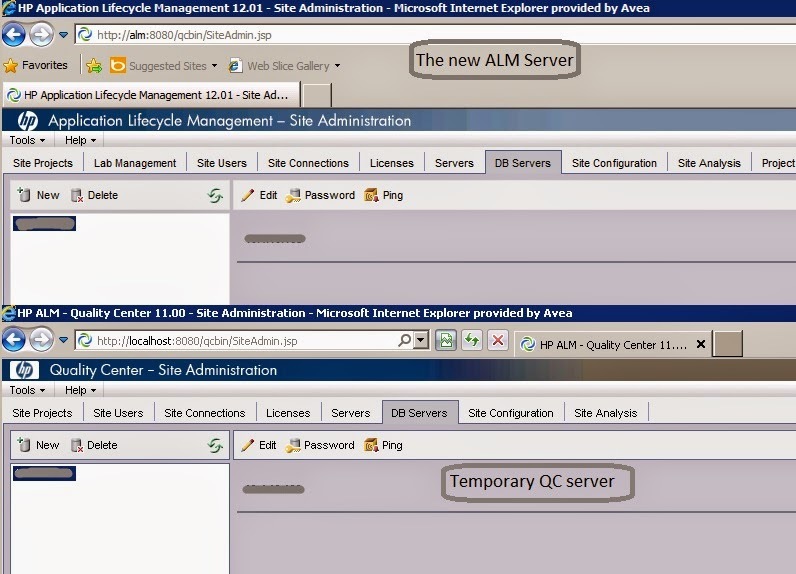 Step 12: From the new ALM Server's Siteadmin panel select Restore Project. Select DBID.XML file and follow the instructions. This process shouldn't take more than 1 minutes. Step 13: After the restore project finishes, you should see the project in the Site Project's tab. Right click on the project and select Maintain Project -> Upgrade Project. This step may take upto 2-3 minutes. You can activate the project now from the new ALM server's siteadmin panel.